Among the speakers were many well known and dynamic speakers. 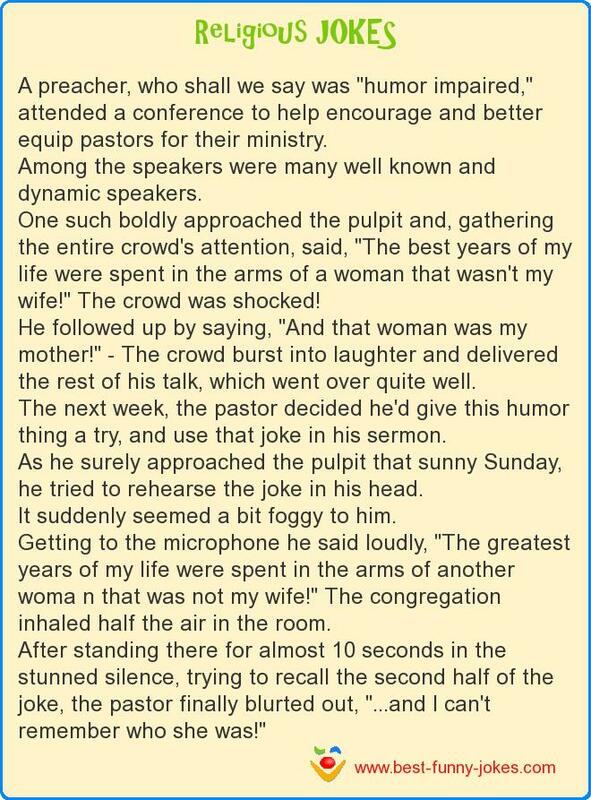 One such boldly approached the pulpit and, gathering the entire crowd's attention, said, "The best years of my life were spent in the arms of a woman that wasn't my wife!" The crowd was shocked! He followed up by saying, "And that woman was my mother!" - The crowd burst into laughter and delivered the rest of his talk, which went over quite well. The next week, the pastor decided he'd give this humor thing a try, and use that joke in his sermon. As he surely approached the pulpit that sunny Sunday, he tried to rehearse the joke in his head. It suddenly seemed a bit foggy to him. Getting to the microphone he said loudly, "The greatest years of my life were spent in the arms of another woma n that was not my wife!" The congregation inhaled half the air in the room.